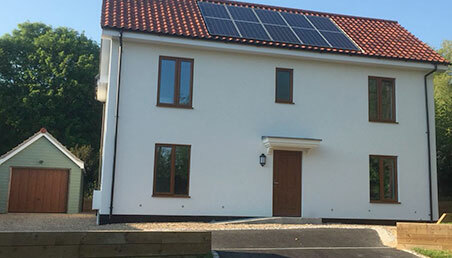 Choosing Passivhaus from Beattie Passive offers a flexible way of life with numerous benefits for all the family. Beattie Passive’s simple, high quality build system delivers above and beyond the benefits of Passivhaus Standard. Beattie Passive buildings are designed for long life and high performance, and alongside meticulous attention to detail, rigorous design and construction and an exacting certification process, Beattie Passive ensures that what is designed is built, and what is built, performs as it was designed. The Beattie Passive system has no restrictions on design. Our design team will incorporate any design, shape or style of architectural drawings into our 3D modelling system and deliver a custom made package incorporating all the key values of our build system. As well as incorporating any design, the Beattie Passive system also has no limitations on external finish, thereby allowing each Beattie Passive home to be as unique as its owner. There are many benefits surrounding Passivhaus and one of the most alluring is its flexibility, not only in design but also allowing you to live how you want even, in a Passivhaus. There are many myths regarding Passivhaus living that aren’t true such as not being able to have a wood burning stove or open a window, but you of course you can. However, you’ll probably find the air quality and ambient temperature so good, that you won’t need to! No more drafts in winter and overheating in summer: The system responds positively to changing climate (overheating and cooling) due to the innovative design and the lightweight structure. Minimal internal structural walls allow buildings to be modified and altered over their lifetime; greatly cutting down on house adaptation costs and providing design flexibility. Easy Maintenance: All Beattie Passive houses have a continuous service void around all floors, walls, ceilings and roofs allowing for ease of maintenance, alteration and access to all services. You receive a high quality building that exceeds Passivhaus standards every time. Robust inspection of key build elements and testing ensures every building is built as designed. With the addition of MVHR and quality windows to a Beattie Passive structure, you should reduce your heating requirements by up to 90%. Due to the high performance building and heat recovery in the ventilation, no formal heating system is required. • Fire safety – Beattie Passive provides you with 2 hours fire protection as standard as opposed to 1 hour for building regulations. This means that it takes double the length of time for a fire to penetrate through a Beattie Passive wall, roof or ceiling. • Sound – Beattie Passive delivers 63db which is six times better than build regulations giving a dramatic reduction in related sound issues between dwellings and external noise such as busy roads or flight paths. • Thermal Efficiency – Beattie Passive can achieve thermal efficiency of 0.11 and below compared to building regulations of 0.28. This means that the building loses significantly less heat than a traditional construction. • Air tightness – delivers as low as 0.06 and below, this means that there is minimal gaps and you are holding the energy in the building. Flood protection is incorporated into all Beattie Passive houses as standard, providing you with the assurance that your homes are tanked to protect you from flood water. You can’t see radon gas, and you can’t smell it or taste it. But it may be a problem in your home. Radon is a naturally occurring radioactive gas that is present to some extent in all rocks underground foundations. Each year there are approximately 1,100 deaths in the UK as a result of lung cancer linked to radon exposure in the home. Beattie Passive fit radon protection as standard, regardless of how small the level in your area. By using the Beattie Passive structure, MVHR and photovoltaic cells together you can achieve 100% reduction in CO2 emissions. Beattie Passive believes that a building should offer its occupants more than just a "roof over their heads"; it should protect them from external influences which may adversely affect their wellbeing and actively promote good health. A Passivhaus has more fresh air than traditional construction techniques. With a mechanical ventilation and heat recovery system supplying a continuous stream of pre-warmed fresh air, your house will be healthy and free of humidity and its associated mould problems as well as airborne pollutants. Passivhaus builds are generally more expensive to build due to the complexity of the construction detailing and the rigorous air tightness requirements. 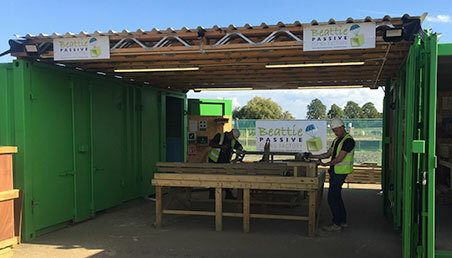 However, as the only UK Company to have a Passivhaus certified complete build system, Beattie Passive reduces the Passivhaus build cost due to the simple structural detailing for walls, floor, ceilings and roofs. The simplicity of the system allows for quick and risk free manufacture and erection. Beattie Passive is designed to be locally manufactured at any location using readily available materials. The system can be easily built by Contractors and Self Builders or manufactured in our factory and erected on site by our experienced team. The use of our bespoke 3D modelling design allows all materials to be measured to within a 1mm which greatly reduces on-site waste as well as over-ordering of materials. Our method of construction offers an easy to assemble frame-link build system allowing just semi-skilled labour to be employed. Beattie Passive are passionate about developing skills in the industry. Beattie Passive opens up a number of exciting community and education project opportunities allowing local young and unemployed people to retrain and benefit, both financially and socially, from a return to the workplace. All materials used are sourced from fully certified supply chains, they are A+ rated in the BRE Green Guide.